Empathic Impression or Psychic Attack? There are many types of energies that can feel assaulting to us; ambient, conscious and unconscious. How do we know what we are experiencing? And what do we do with it? July 15th 2014 - Empathic Impression or Psychic Attack? Excerpt from "Psychic Self-Defense for Everyone: Why You Need It and What You Need To Know (Paranormal Activity Book 2)"
Ambient energies that affect us include emotional imprints and stray emotion energetics. These phenomena do not have consciousness. Not having consciousness means that it cannot interact with you or its environment. The first phenomenon is what is called an emotional imprint. An emotional imprint is created when an emotionally charged event takes place in a space. This can be accomplished by a similar impression being left a multitude of times in the same area over a long period of time, such as a slaughter house, or a wedding chapel or hospital. Or it can be the imprint of one major event, such as a battle, or a murder suicide. Places like Gettysburg and Valley Forge have emotional imprints from the battles and the torment of the men who fought and died there. These emotional imprints are like stubborn stains in the energy field. They tend to hang there and are very difficult to remove. The most noticeable emotional imprints are comprised of intense negative emotions, like rage, fear or sorrow and are sometimes confused with a ghost or a haunting. Emotional imprints aren’t always negative, however. They can be formed by intense love, loyalty, joy and devotion also. We just don’t tend to notice those quite so much. Have you ever been in a place where you just feel really happy or peaceful? Maybe a wedding chapel or a room in the house, somewhere that people experienced joy on a regular basis. This is an emotional imprint. You can walk into or through an emotional imprint. The energy of the imprint in the form of emotion generally does not stick to you, UNLESS you talk yourself into experiencing the emotion and make it your own. For instance, if you walk into an angry emotional imprint and search for a reason to be angry to explain the feeling, you rationalize the experience. You then feed the emotion with reasons to be angry and sustain the feeling long after you have left the imprint area. This is why awareness is so important. We can also talk ourselves into accepting other people’s emotions as our own; our empathic ability exposes us to this. We can feel these emotions as strongly as our personal emotions. When we are viewing the individual and the emotion is expressed, it is easy to discern where the feeling is coming from. However, many of us do not wear our heart on our sleeve and so are a bit more difficult to read. With empathic ability proximity is a factor for most people, the closer we are to the person, the stronger the emotional link. This is especially true when dealing with strangers. As I mentioned previously, there is now scientific evidence that empathy is shared by primates and can be pinpointed in the brain. This sense can be developed into a psychic ability where you only need to hear a name or have a birthday to create a connection of emotional energy. We also often create these close emotional connections with the people we care about and thus can sense when they are in distress from a distance. Many empaths don’t even realize they have this ability because they take ownership of the emotions they sense. There are some things you can do to discern if an emotion is yours or generated outside your self. Your Self-Awareness is the key. Be aware of your thoughts and feelings on a consistent basis. If you are feeling content and neutral then suddenly feel angry, notice the feeling. DO NOT try to justify it – ‘Why am I angry?’ Is not a useful question. Instead ask ‘Is this mine?’ Acknowledge the ‘No’ you receive. [I accept silence as a no] Then you can dismiss the feeling. Say ‘Thank you for the information. Now go back to where you came from’ or simply direct the energy away. You can also use a variety of shielding and cleansing techniques to clear your energy of these stray emotions. You may also use a diversity of gemstones to deflect or transmute negative energy. I will go into each of these techniques in more depth a bit later. The difference between a consciously directed energetic attack and simple empathic overload is fairly simply; the attack is consistent, it continues until it is directly addressed. When we pick up on others’ emotions, once we discern that it is not our own, we can separate from it. That being said, it is not always easy to separate, and some people find it more difficult than others, especially if they are not trained. Regardless, you can discern that it is not you on a conscious level. Conscious directed energetic attack can be simple energy direction or more nefarious utilizing a variety of entities. The severity of the attack will dictate the method for removal. That being said we always begin in the same place – a general clearing. If it is a direct attack using general cleansing techniques will help to ‘loosen’ the energy. A kin to the conscious energetic attack is the unconscious. Remember being told not to wish bad things on people? And to be careful what you say? This is why. When we direct our energy towards others, even in an off-hand remark, the Universe funnels energy into our intent. The force may not be quite as strong as a directed attack, but harmful never the less. The negativity rides on your emotion, so if it is something that you obsess about in any degree you are feeding the negativity. This harms the sender and receiver. Expending energy on negative pursuits drapes you and pulls you down with your victim. Remember always to walk, think and speak in compassion and kindness. It works. Blessings! 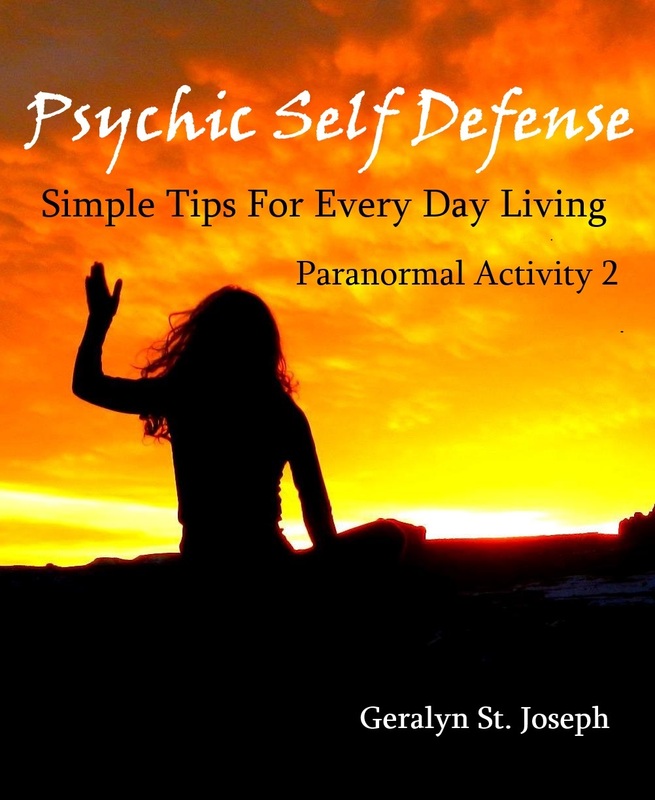 By Psychic Intuitive Geralyn St Joseph. For more information, see this page.